As the weather in Massachusetts starts to get cooler, the chance of snow and ice lingering on the ground increases. Snow and ice on pathways, driveways, in parking lots and throughout the city present a significant risk to pedestrians and visitors since it is all-too-easy to fall and suffer a serious injury. This winter season, our Boston personal injury attorneys want to remind homeowners and business owners to take precautions to make sure their property is safe so visitors aren’t at risk of slipping and falling. We also want to remind pedestrians to be cautious where they walk to avoid the risk of a fall. If you are a property owner and people come onto your property, whether those visitors are customers, friends, family or the mailman, you have a responsibility to make sure the property is reasonably safe. Normally, this means keeping your property in good repair and either fixing any dangers that you are aware of or warning guests that there is a hazard. As winter approaches, however, your responsibility for keeping up your property may also extend to keeping your space free from dangerous snow and ice. If you fail in that responsibility, you may be held legally liable for damages if the ice or snow causes an injury. 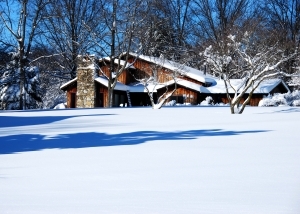 Property owners in Massachusetts weren’t always subject to legal liability for all snow and ice on their property, but an important change in the law occurred in 2010. According to Mass Live.com, the Massachusetts’ courts changed a centuries-old rule that protected homeowners from liability. Under the old rule, property owners weren’t held responsible if they failed to remove natural accumulations of snow on their property. Natural accumulations were defined as snow put on the property by Mother Nature, as opposed to piles of snow made by the snowplow. This changed, however, after a man broke his pelvis in a patch of ice on a parking lot in front of a Target store. The parking lot had been plowed, with a pile of snow left in the median strip. There was a dispute over whether the slippery patch that caused the fall was the result of a “natural accumulation” or not, but the Supreme Judicial Court ruled that it did not matter. Effectively, a new rule was created by this case. The new rule mandates that any accumulation of snow or ice that presents a danger to visitors can be considered a “defect” with which a property owner has to deal. Under this new rule, property owners would be wise to ensure that their properties are always kept clear of snow and ice that could be dangerous. This may mean a few minutes shoveling the walk, but it is worth avoiding the potential for legal liability. Pedestrians, too, should take steps to protect themselves from a fall this winter. This can mean wearing appropriate winter boots or shoes and watching carefully where you are walking. Ultimately, however, it is the owner of a property who has a duty to visitors and guests to keep the property reasonably safe, and if a pedestrian is hurt as a result of a slip and fall on ice, the pedestrian may be able to take legal action to recover damages from the property owner. If you have been injured as a result of a slip and fall, contact Personal Injury Lawyer Jeffrey S. Glassman for a free and confidential consultation to discuss your case. Call 877-617-5333. Massachusetts Supreme Court rules property owners liable for all snow and ice accumulations, Mass Live, July 26, 2010.